Looking for a traditional, classic greeting card to send out for your greeting, invitation or announcement, then look no further than our custom folded cards. Our folding greeting cards can be personalized with photos and text whether you’re creating custom wedding invitations, graduation announcements or holiday greeting cards. We offer so many styles and custom options that you’re guaranteed to have a card designed that’s perfect for any occasion. Designing your own folded photo greeting cards doesn’t get simpler than this. Once you have a photo picked out and ideas for your card layout, let your creativity flow and create a stunning card stock folding card that’s perfect for any holiday or upcoming event. Begin by uploading your photo to Winkflash. Choose a photo from your digital image storage or scan and old photographic to add a unique twist to your greeting. Afterwards, select your card’s orientation. Then, choose your style. Pick from dozens of templates that are tailored to a bevy of occasions. Once you have your style chosen, you can drag and drop your photo onto your card layout in the project builder. After adding your photo you can enter your own message using our text feature. Finally, review your card, add it to the cart and place your order. Once your order arrives in the mail, you can hand write your own message to each of your recipients for a truly heartwarming greeting card. Not only will your cards showcase a favorite photo, but they will allow you send a little love to family and friends throughout the year, no matter the occasion. Getting ready for your high school senior’s graduation? Make collage graduation announcements that bring their memories to life! You can also include your own text to remind family and friends of the time, date, and location of the ceremony and party afterwards. Our folding photo cards can be custom printed on the front with your text on the inside for a formal graduation announcement that compliments the occasion! 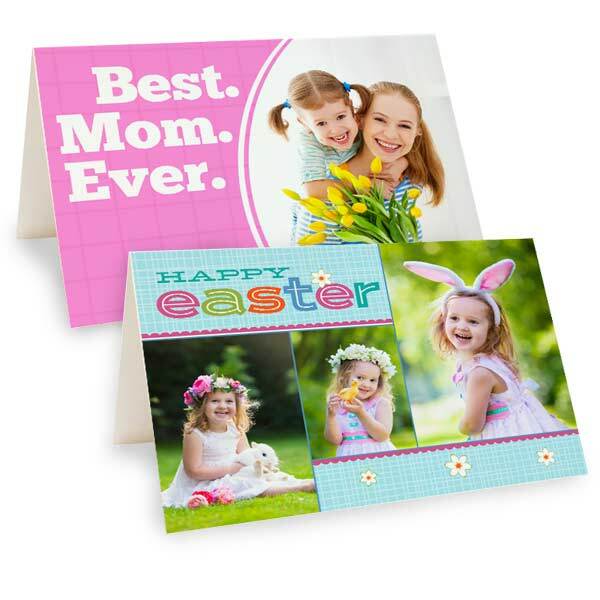 Along with a personalized Mother’s Day gift, you can create a Mother’s Day photo card that features Mom’s favorite moments. Just choose a template, upload your photos, and add your own text to complete your card design online. We have so many custom options to choose from, you’re sure to the create the perfect greeting that makes Mom’s day! Make Dad a Happy Father’s Day card with his more treasured memories. Maybe you have a couple of pictures from your last hiking trip together. Or, there’s some great snapshots on your phone from your last visit. Upload them to Winkflash, pick a template, and arrange your photos on the front of your folding card. Then, choose a text font and size, and add a personalized message on the inside to show him how much you care! Already have a card picked out? We offer photo gifts for Dad that can’t be beat! Pick out a gift and personalize it in minutes with pictures from your phone or laptop! Keep up with loved ones throughout the year with our folded photo greeting cards. They make ideal personalized stationery since you can choose from a variety of templates that are perfect for a simple “hello” or even select from multiple seasonal themed templates to keep up with those closest to you year round. If you are looking for the perfect stationery to use, our custom folding photo cards couldn’t be better. Use our full photo template and add your all time favorite photo to the front of your card. Leave the inside blank for your own handwritten message and send out your own stationery, anytime. Personalized greeting cards are a great way to keep up with those you love, no matter the time of year. Whether you are planning a birthday party, a baby shower or just a yearly celebration with family and friends, we offer a wide variety of templates that will allow you to build the perfect invitation. Add a photo to give your invitation a unique feel and use our text feature to add details about your upcoming festivities. Our photo invitations will impress your recipients and are a great way to get your guests excited about your fun-filled party. If you’re throwing your best friend a baby shower, create for her a custom baby shower invitation that includes a flattering photo printed on our personalized folding cards. Include the time, place and date along with a little message on the interior of the card and send them out to all her closest friends and family members to kick off a baby shower she won’t forget. Our custom folding cards also make the ultimate birthday invitation. Choose from several birthday invitation templates and include a fun photo of the birthday boy or girl to invite their relatives and friends to their birthday celebration. Customized birthday invitations not only add a personal touch to the occasion but are a great way to make a birthday party special, not matter whose celebration it is. Design your own custom thank you cards that are perfect for showing your gratitude for a special gift or simply thanking a friend or relative for a good deed. No matter the occasion, you can create your own thank you notes to show how much your loved ones are appreciated while incorporating your own style into your card’s design. Include a favorite landscape photo from a mountain hike you took at sunset or even scan your own artwork and add it to the front of your card for a personalized look. Whether you’re thanking a loved one for a Christmas present or a neighbor for watering your plants during your last vacation, a personalized thank you card is guaranteed to make your recipient feel special. Are you in the midst of planning your wedding and have finally decided on a date? Look no further than Winkflash to design the perfect save the date card to share your wedding plans with everyone in your social circle. Our folding save the date cards let you to add a romantic photo with details about your wedding day. We offer a variety of templates that are a great fit for any style and can even compliment your wedding’s elegant style and color palette. Design the perfect graduation announcement or thank you graduation cards with your own unique touch. Our 5×7 folded cards are perfect for letting loved ones know about your upcoming graduation plans while including a favorite senior photo. Add text that gives all the details about your graduation celebration and send them out to keep you friends and family in the loop. With a little creativity and a favorite photo, you can design a beautiful custom folded card for any occasion. Whether you want to create your own greeting cards, make your own invitations or design your own announcement cards, Winkflash offers a huge variety of customized options that are perfect for your photo card project. Display a favorite picture and include your own message to give your greeting your own personal touch. Upload your photos to Winkflash and design your own folding photo cards today!